Professor Jesper Z. Haeggström and associates at Karolinska Institutet in Sweden have reported that Montelukast, a common asthma drug can retard the development of aortic aneurysm in mice. At present there is no effective drug treatment available for Aortic aneurysm and Montelukast can be developed as a potential treatment for this serious condition. Researchers have published their findings in journal PNAS. “Our results are exciting and open the way for a medical treatment of this serious vascular disease,” says Professor Jesper Z. Haeggström at Karolinska Institute’s Department of Medical Biochemistry and Biophysics. 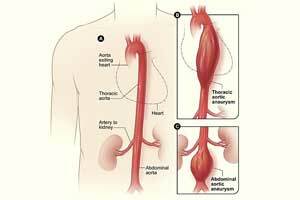 An aortic aneurysm occurs when the wall of the body’s largest artery, the aorta, weakens and swells. The disease progresses slowly and affects some 5 percent of men and 1 percent of women over the age of 60. The condition is largely symptom-free and is normally therefore not discovered until late in its development when it threatens to rupture and cause life-threatening haemorrhaging. There are currently no drugs for preventing and treating aortic aneurysm. The study was conducted with researchers at Linköping University in Sweden and the Technical University of Munich, Germany and financed by the Swedish Research Council, Stockholm County Council, the Novo Nordisk Foundation, the Heart and Lung Foundation, the Ragnar Söderberg Foundation, Karolinska Institutet and the European Research Council (ERC).